This Sunday, October 18th, marks the final Rise & Drive event of 2015. I only discovered the event last month, but it's exactly what car culture in this city (and everywhere) needs. Too often, automotive gatherings become homogenous, even exclusionary. The "not my brand/style/era/race" attitude is doing more damage to car culture than high gas prices, student debt, or smart phones ever will. It's an understatement to say that there's a struggle with diversity in this country, and while it may be dramatic to think that cars and coffee can solve the nation's problems, it was immediately clear that I'd found something special at Rise & Drive. A city like Chicago will naturally have exotics. Spend a summer evening in River North and any number of Italian steeds will pass by. Seeing a vintage Lamborghini Muira parked next to a 240SX, though, is something unusual. In the title shot above, Japan, Italy, and the USA are all parked side by side. Muscle cars sit side by side with modern imports and lowriders. The best part, though, is that the owners are as diverse as the vehicles. Hailing from all parts of the city and beyond, people from every automotive subculture come together around a common pastime. Rise & Drive gives back, too. The organizers have partnered with Ronald McDonald House, a national charity that provides families of seriously ill children with a place to stay while thier loved ones recieve treatment. For anyone in Chicago who enjoys all types of cars, come to the South lot of Soldier Field this Sunday for one last show before winter! Like a WWII ace, the Viper wears the silhouettes of tracks it's conquered. Earlier this week, Klaus Busse was named Industry Innovator of the Year at an award ceremony held on the eve of the NAIAS. I met Mr. Busse, Chrysler's VP of Interior Design, two years ago during the Social Media Preview of the Chicago Auto Show. I complimented the Viper's "Striker" shift light, and he proceeded to give me a personal tour of the Viper's interior. He pointed out the small details, like the Nürburgring traced in the door pocket, and Laguna Seca hidden in the center armrest. 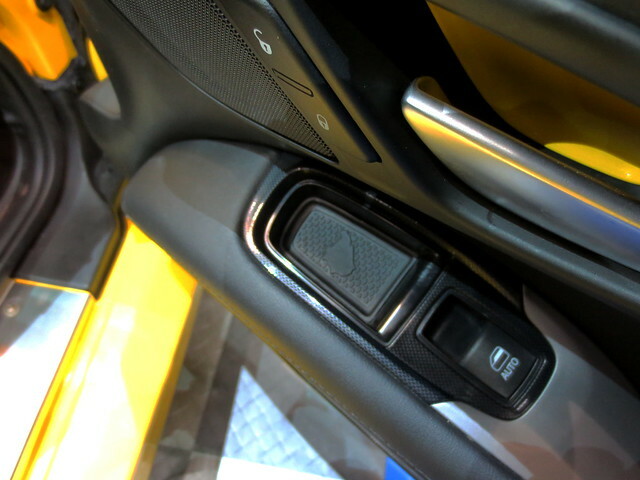 "Easter Eggs" like those are now found across FCA's lineup. As a software engineer, I consider myself a craftsman, and I like to think I can recognize another. Details like hidden racetracks, skylines, and desert trails in a car's interior are a sign that the designer isn't just doing his job - he's someone who truly enjoys his work. I'll never forget it - a lowly blogger getting a tour of a supercar from the man who designed it. Urban Gear Works congratulates Klaus Busse on an award well deserved! Just tie a tree to the roof and suddenly, it's Christmas 1966 all over again. 2013 has been a busy year offline for Urban Gear Works. Consequently, some of my bigger plans for blogging this holiday season just didn't make it. A follow-up to last year's Twelve Days of Christmas list was planned, but never completed. This blog has always been about doing something I love, though, so I wanted to make sure I did something before the holidays passed. 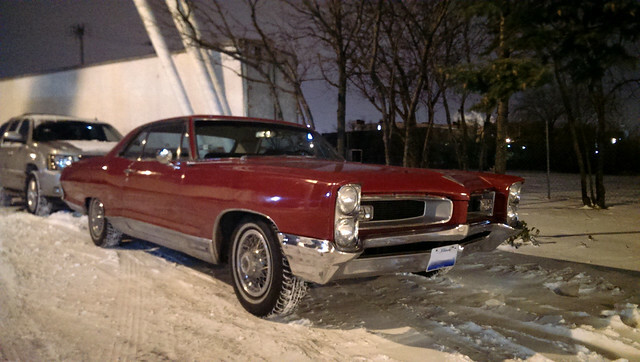 I found this Pontiac Grand Prix in the most unlikely of places on a bitter, snowy night a few weeks back. It wasn't the kind of night when one would expect to find such a clean classic out in the open; temperatures were in the single digits and snow had been falling for days. In fact, given that the car itself was completely clean, it had to have recently come out of storage after the snow had already fallen, meaning whoever owns it brought it out deliberately. Most owners of a car this vintage have their pride in deep storage by the end of October, and more than a few collectors would view exposing a machine to salt and snow as reckless. This owner, though, has taken a different route, and that's the Urban Gear Works Christmas wish for 2013: do what you love, and enjoy what you have. Merry Christmas! There's just a little more than a week left before Christmas, so here's a last minute gift idea from Urban Gear Works. 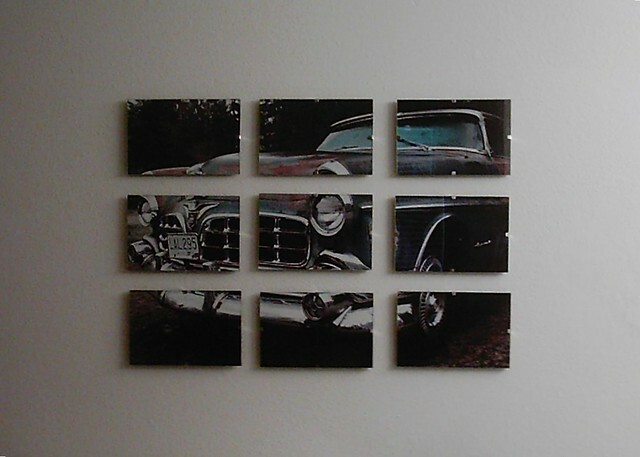 With just an hour or two of work and about twenty dollars, you can create a stylish gift that will look great in most any home or office. Porsche has just released information on the new range-topping Panamera Turbo S in anticipation of its debut at the Tokyo Motor Show next month. Boasting 50 more horsepower than the current Turbo model, for a total of 570, nearly 600 pound-feet of torque vectored to all four wheels, and carbon ceramic brakes to bring the executive super saloon to a halt, the new Turbo S just may be the most elite four-door on the planet. Urban Gear Works has always been a fan of the Panamera. While the characteristic Porsche silhouette applied to a sedan has been polarizing, your editor has a special affinity for anything with a fastback roof line, ranking the Panamera's shape among other icons like the Hudson Hornet, Tatra 77, and first-generation Dodge Charger. Imagine the excitement, then, when the press photos for the new flagship featured not New York, Los Angeles or even Miami, but the great Second City, Chicago. It appears that Porsche chose Cityfront Plaza, between the University of Chicago's Gleacher Center and NBC's Chicago headquarters, as the backdrop. Curiously, however, the image appears to have been flipped, because there is simply no way the distinctive London Guarantee Building could appear on the northern side of the Gleacher Center. Whatever the reason for the image manipulation, it's great to see a few of our favorite things together, and it's nice to see Chicago getting the respect it deserves. 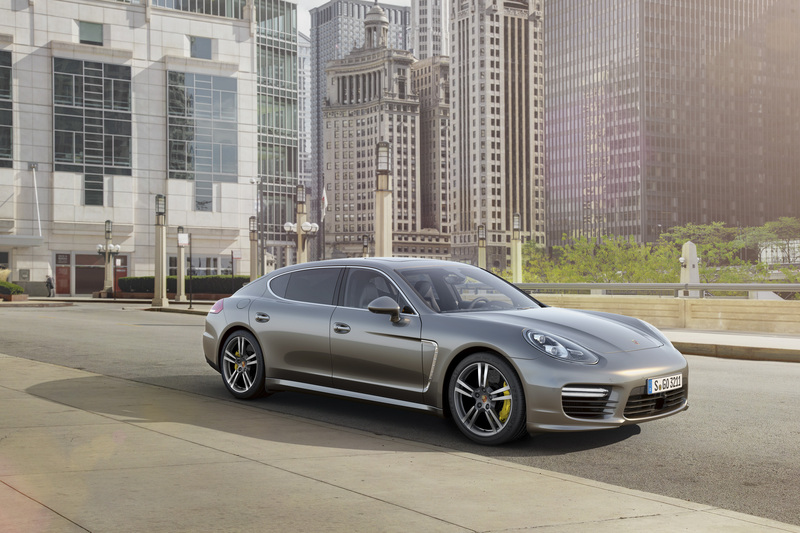 The full press release on the Panamera Turbo S can be read here. Second- and third-generation VW Westfalias. Today is a sad day, in a way that's all too common in a big city like Chicago. People are always moving through big cities on their way to Somewhere Else. Sometimes those people become your friends, and inevitably the day comes when they tell you they're moving on to that other place. You hope it won't happen, that they'll come to love your city the way you do and decide to stay, but most of the time it's clear it won't work out that way. I get it. I lived away from Chicago for a time, but I always felt like I belonged here. For these friends, the Pacific Northwest is the same. They have different coats for every five degrees of weather, nice bicycles, a Subaru, and equipment for just about any outdoor activity for you can think of. This is for them. If your friends don't ever teach you anything, you probably aren't listening. Along with many other, more important things, these friends taught me that people get excited about all different types of cars. We tend to have an idea in our head about what makes a car exciting: speed, power, sound, style, luxury, capability, and all the other tropes advertising firms love to trumpet. What if a car could be exciting not by virtue of itself at all, though, but because of what one could do with it? My friend showed me that it could. 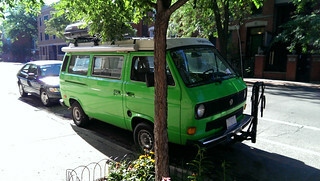 I don't recall the exact conversation, but I'm pretty sure I was rambling about some car or another, when she interjected, "You know, I've really found myself wanting a Westy lately." I was shocked. 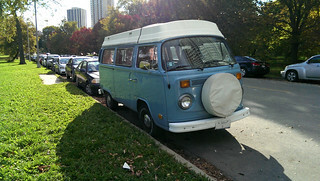 The only time I ever had anything resembling an emotional reaction to a VW Microbus, said bus was on fire. Now, here was my friend, who had never really expressed interest in anything automotive, voicing the kind of longing I reserve for vintage Mopars, and using a nickname. The more I thought about it, though, it made sense. This is a person who loves kayaking, biking and triathlons - a Volkswagen camper van is probably the perfect thing for an outdoor adventurer. 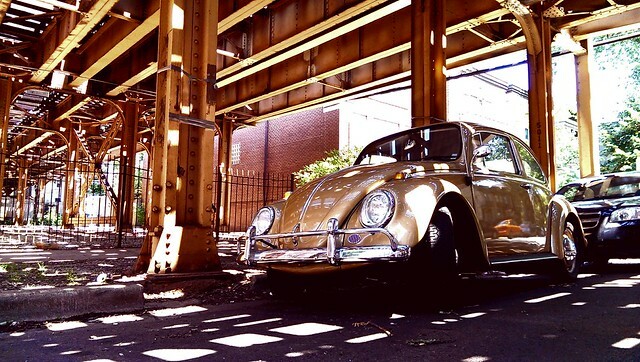 I always wanted Urban Gear Works to be about all of car culture in Chicago, and because of my friend, I realized that means more than just including both domestic and foreign, cars and trucks. It means thinking about the fact that people have very different definitions of "interesting". To my friends, Chicago will miss you, but I hope you find everything you're looking for in the Northwest, including your Westy. Just please, keep a fire extinguisher handy. City Survivors are photographed in public places. Every attempt is made to respect the privacy of the owner. License plates, faces and other identifying information are intentionally obscured. 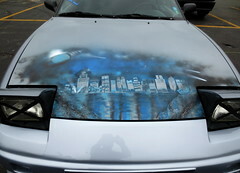 If the owner does not want their car displayed, Urban Gear Works can be reached through the contact form. 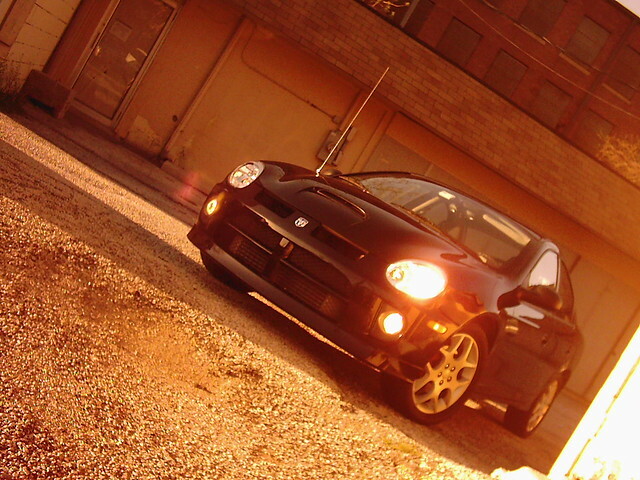 Alternately, Urban Gear Works welcomes any owner who wishes to share more about their vehicle. 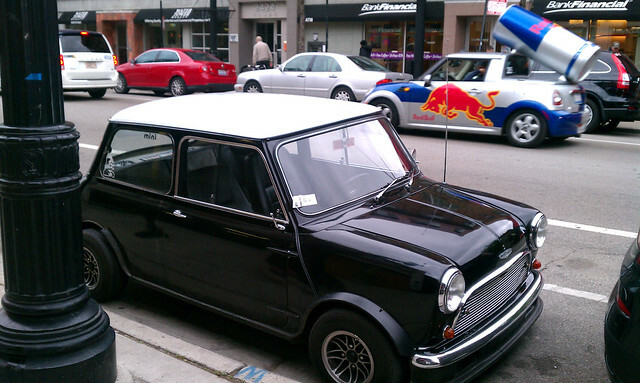 I found this Austin Mini parked street side several months back. It looks to be of the Mk II variety, built from 1967 to 1970. Clearly visible in the pictures are many of the practical design elements that made the original Minis so successful, such as sliding windows to make room for storage in the doors, wheels pushed all the way to the corners to expand the passenger compartment, and the bottom-hinged trunk, designed to be left open for hauling large loads. If the badges are to be believed, this is the hot "S" version, but with half a million Mk II Minis built, "S" production percentage is only in the single digits. Horsepower figures for even the hottest Minis didn't crack triple digits, but their light weight and extremely low center of gravity made for a steady stream of racing victories in their time. Regardless of provenance, the upswept center exhaust, ground effects, and dropped stance swing this Mini away from the usual cute and well into aggressive. 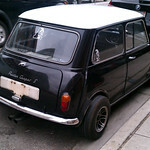 On start-up, this car snarled like a dirt bike, and any car with tires wider than they are tall deserves some respect. Tonight at Pebble Beach, Cadillac unveiled their latest concept, the Elmiraj Grand Coupe. In a word, it's stunning. The deep blue finish plays with light in a way that accentuates the razor-edged metal origami of the Art & Science design language. More interesting, though, is the way the Elmiraj perpetuates themes that debuted at Pebble Beach just a few years ago on the equally beautiful Ciel. Both have an upright, regal front, knife-blade lighting, long, flat sides, a sweeping lower character line, and a distinctive vent just behind the front wheel well. Both have a look that futuristic but not outlandish, and distinctly American, distinctly Cadillac. Where the Ciel was a four-door convertible, though, the Elmiraj is a long-hood, short-deck grand tourer in the style of the Eldorado, once the crown jewel of the Cadillac marque. In fact, Cadillac's Twitter account has been posting vintage Eldorado pictures all week, and Clay Dean, executive director of advanced design, specifically recognizes the 1967 Eldorado as a major influence. The Eldorado was the most Cadillac of Cadillacs - it was big, luxurious, glitzy, and powerful, holding the corporate record for both longest coupe and largest engine, at 500 cubic inches. The Elmiraj's twin-turbo V-8 displaces just over half of that monster's 8 liters, coming in at 4.4, but it replaces cubic inches with output, and is estimated to produce around 500 horsepower. Normally, the interior would be considered typical concept fare, but given the cockpit of Cadillac's most recent concept-to-production, the ELR, the envelope of possibility seems a bit wider than it used to. Cadillac's press release points out quite clearly that Cadillac "approaches concept cars as a method for projecting design forward rather than ... future production models", which raises the specter that this is just another one-off, destined to be nothing more than an ornament for the foyer of Cadillac headquarters, like the Ciel and the Sixteen before it. Hopefully, this isn't the case, as Cadillac's Art & Science theme is producing some of the best looking, most distinctive cars on the market today. The Elmiraj would stand out parked next to an Aston Martin or Bentley Continental, which certainly achieves the mission of showcasing "the top of the brand's expanding range". Despite the Cadillac's emphasis on "design studies" and "vision", there is a light shining through. Buried within the press release, there is one very important detail: the Elmiraj rides on a rear-wheel-drive platform destined for future production models. Clearly, given the concept's size, this can only be the highly secretive flagship meant to slot above the XTS. Only time will tell, but if Cadillac's latest concepts genuinely do showcase the brand's vision, the best is yet to come. Almost everyone who loves cars also loves to take pictures of them. So, it's time for what will (hopefully) be a recurring segment on Urban Gear Works, highlighting great photo locations around the city. Usually, people take pictures of their own cars, but when I came across this VW Beetle, the opportunity seemed too good to pass up. There's just something about the CTA's elevated lines that makes them a great spot for a photograph. Maybe it's the multiple faded coats or paint or the rows of rivets. It could be the distressed beauty of rusted supporting arches. I think the best feature, though, is the way the beams break up the sunlight, draping complicated patterns on whatever's underneath.